As I discuss in this question, by far the most popular school of Hindu philosophy is the Vedanta school, which bases its tenets on the doctrines laid out in the Brahma Sutras, a work by the sage Vyasa that summarizes and systematizes the philosophical teachings of the Upanishads. (You can read the Brahma Sutras here.) But the Vedanta school didn't always have the dominant position in Hindu philosophy; before the time of Adi Shankaracharya the dominant school of Hindu philosophy was the Purva Mimamsa school, which I discuss here. In contrast to the Vedanta school which is devoted to analyzing the Jnana Kanda of the Vedas, i.e. the Upanishads, Purva Mimamsa focuses on analyzing the Karma Kanda of the Vedas, i.e. the Samhitas and Brahmanas. Therefore, even if there were a conflict between the Bhagavan's doctrine and the Veda, there still would be option between them; but we have already expounded that there is no conflict between them at all. Objection: However, how can the venerable author of the Bhashya state that those parts which are in conflict are invalid: "If there be conflict, it is carefully eliminated." Refutation: This statement means that those of frail minds, who are to strong enough to plunge into the deep ocean of rules of interpretation, must not be disrespectful to the Vedas. This is comparable to the venerable Jaimini's exposition that the fruits of acts serve to increase people's faith in the acts. I discuss the identity of the Bhashyakara in my question here. But now I'm interested in the statement at the end of the quote. My question is, what is Yamunacharya referring to when he talks about "Jaimini's exposition that the fruits of acts serve to increase people's faith in the acts"? For those who don't know, Jaimini is the author of the Purva Mimamsa Sutras, the defining text of the Purva Mimamsa school. So what statement or statements in the Purva Mimamsa Sutras is Yamunacharya referring to? And what does "the fruits of acts serve to increase people's faith in the acts"? Does it mean that the reason that actions like Yagnas bear fruit is to increase people's faith in doing Yagnas? Or does it mean that the Vedas describe the fruit of Yagnas to increase the people's faith in Yagnas, or something else? And what does Yamunacharya mean by saying that the Bhashyakra's statement is "comparable" to Jaimini's statement? Does he mean that just as the Bhashyakara was only pretending to criticize the Pancharatra Agamas, Jaimini also pretended about something? And if so what did Jaimini pretend about? This may be related to my speculation in this answer that Jaimini didn't sincerely believe in the Purva Mimamsa school. Jaimini in his Purvamimamsa goes to the extent of denying the physical form, much less the existence of an order of beings called “gods”, with the view that those who have not learnt the Upanishads, may develop faith in the efficacy of sacrificial rites. 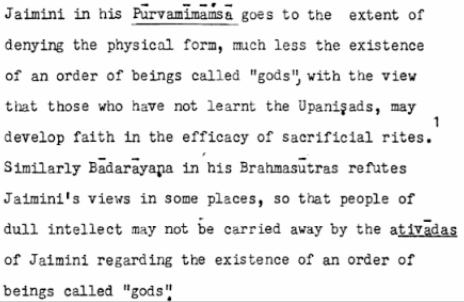 Similarly Badarayana in his Brahmasutras refutes Jaimini’s view in some places, so that people of dull intellect may not be carried away by the ativadas of Jaimini regarding the existence of an order of beings called “gods”. So it’s like a benevolent form of deception. Not the answer you're looking for? Browse other questions tagged karma vaishnavism sri-vaishnava purva-mimamsa jaimini .